Paul Wilkerson’s interest in local weather proved essential this season. Lots of people come to the Turks & Caicos and fall in love with its turquoise waters. Paul Wilkerson went further. 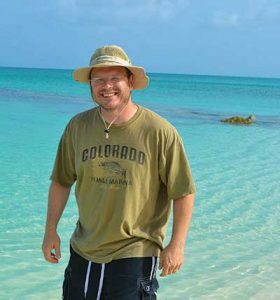 The American meteorologist extended his love to the TCI’s clouds, winds, rains, dry spells . . . and particularly to its people who live in this special climate. For them, he created a Facebook page that focuses on local weather, not knowing how popular and essential it would become during Hurricanes Irma and Maria. Meteorologist Paul Wilkerson provided an important service during the hurricanes. He knew he was the guy for the job because of his regular paying job: non-commissioned officer in charge of the Arkansas National Guard’s 154th Weather Flight unit, a position he has held since 2007. He has worked in meteorology for 23 years, completing the requirements for a Bachelor’s Degree in the field at Mississippi State University and the United States Air Force weather observing and forecasting course. He also worked for the U.S. federal government as a civilian meteorologist from 2001 to 2007. “While my primary profession is military, the weather page is something I do in my free time when I am not at work,” Wilkerson explains. He was already running a Facebook page devoted to his area of Arkansas when he decided to perform a similar service for TCI. Meanwhile, at the other end of the Facebook page, followers were checking their feeds frequently to get Wilkerson’s updates and sharing them with both Islanders and relatives and friends in other countries. Many in the U.S. were thankful to get information that their usual sources, such as The Weather Channel, were not sharing until the storm got closer to Florida. Much of the TC Weather Info hurricane relief fund purchased supplies for South Caicos. The fund drew more than 270 donors, and the money was spread across many needs. Donations went to Pampered Paws, the Provo Rotary Club (to distribute to schools), TCI Boat Club (to help the elderly), Wellington Williams (early food distributions) and the TCI Reef Fund.Large portions of the fund purchased such items as flashlights, mosquito repellent, sanitizer and feminine care products, which were sent to South Caicos via ferry, as that island was deemed most in need. 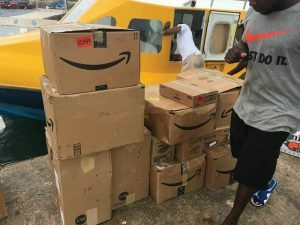 Shipping and delivery efforts were helped by Tito and Atekah Seymour and Tom and Kate Tewksbury on Providenciales, and Earleen Elliott on South Caicos. Again, Wilkerson adds Brande to the list of helpers, as she was co-administrator of the funds. Wilkerson continues to monitor TCI weather and regularly update the Facebook page, and he and his family continue to visit the Islands, staying at various places beyond the usual tourist spots. He says he would like to visit all of the country’s islands eventually. And as for weather, he notes that information for the TCI is improving all the time. He was impressed with the DDME response to Hurricanes Irma and Maria, including shelter and utility information. “Information from multiple reliable sources is key to overall success,” he notes. Drops of moisture in the air are just small things, separate and almost insignificant. But when a lot of them come together, they are a cloud. Likewise, people who come together, particularly in an emergency, are a community, a family. Given that, the Wilkersons of Arkansas are most certainly a part of the TCI family. Jody Rathgeb is a long-time contributor to Times of the Islands. She spent the hours before, during and after Hurricanes Irma and Maria monitoring the Turks and Caicos Weather Info page on Facebook and sharing it with others. She made many new Facebook friends!